It has been a long, harsh winter and I for one am glad the snow has gone so after all of that what else is there to do when the sun comes out but to take to the road and capture some of County Longford’s outdoor splendour. When we first moved to County Longford, we took a trip to the West coast where we encountered the curiosity of a young woman in one of several shops we visited. Where were we from? Where were we staying? They were friendly questions to initiate conversation and then we told her – we had moved to Longford. Her response was rather unrestrained. Longford? Why Longford? In fact, other people we met on that trip assumed that we would have moved to the West coast. That is, after all, where the natural beauty of the country is celebrated through the Wild Atlantic Way tourist brand. Sadly, that just goes to show how untrumpeted our own little corner of Ireland is. So, why Longford? 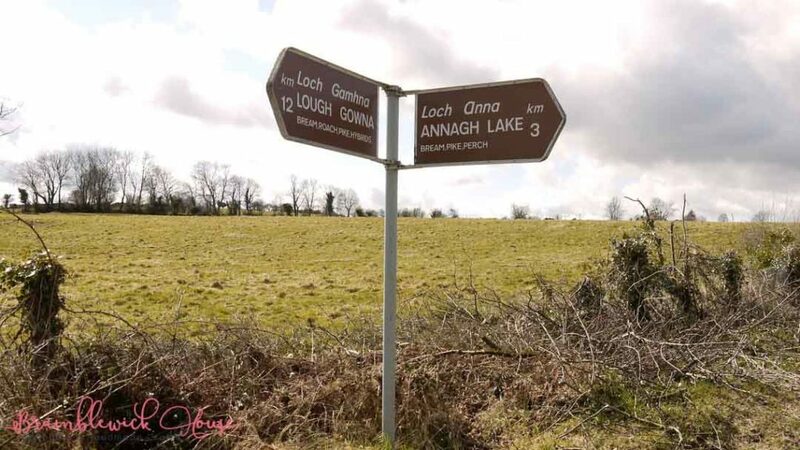 Longford is bound top and bottom by loughs, large bodies of water of great natural beauty, rich in wildlife and renowned for the sport they offer anglers who come from all over Europe to fish from shore and boat. Today we went to the north to the lakeland area of Lough Gowna. I actually know a man from my native county of South Yorkshire who used to come fishing here with his late father. He was so enamoured with it he moved to live in the area and has steadfastly refused all attempts by his children to get him to move back. It’s perhaps testament to the beauty of the region that it should still has such a hold even though his health no longer allows him to get out the boat and sail its waters. Our drive up to Gowna took us on the road to the village of Aughnacliffe, past the ever present navigation point of Corn Hill and numerous sign-posts pointing to different lakes and the coarse fishing opportunities available – perch, bream, roach and pike for the most part – but for us it was the views that stood out. The rolling hills allowed glimpses of Annagh Lake’s glassy surface below us. 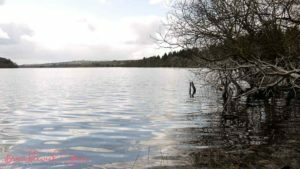 This is not the same place in County Cavan as listed by Discover Ireland and, judging by the amount of coverage of it on internet, has to rank as a hidden gem for fishermen and walkers alike. More information on the extensive fishing opportunities in the area can be found on Fishing in Ireland’s website. As we drove along, we looked out for vantage points to stop and photograph what really are stunning vistas only a short trip from our glamping site here at Bramblewick House. Up in a high place with the sun on one’s face and looking down on the patchwork of fields and scattered farmsteads with their smoking chimneys, it is easy to forget the worries of the world. The pace of life seems to drop right down and there is a real sense of peace and quiet. Once over the tops, we dropped down into Aughnacliffe which is worth the visit simply for its community constructed recreation area, complete with an impressive zip wire in its playground, a fairy garden, exercise machines around its very popular park walk and picnic area on the shores of Lough Leebeen. The town is also home to a well preserved and sign-posted Neolithic dolmen and there is a second even more impressive one on the northern side of the lough which I haven’t yet seen but that’s for another visit. All of this is within striking distance of us for the cyclist with time and energy to spare and it would make for a great hike to fill a day. 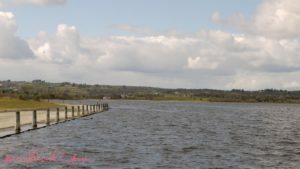 Leaving Aughnacliffe, it is only a short distance to picnic spots by Lough Gowna at Strattens Shore going north and Dernafest and Dring, where boats can be launched, in a south easterly direction. Between the last two places there is the walk through Derrycassin woods. Here we found that a new children’s play area had been built right at the start of the trail next to Colm Cille GAA ground. 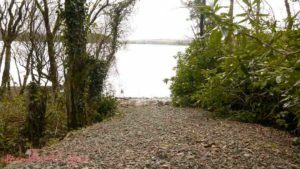 From there, the path winds through the woods and along the shore of the lough and takes you to an arched doorway in a stretch of wall that appears surprisingly from between the trees. The initial response to this is puzzlement. Why is there this structure in the middle of the woods? Who put it here? How long has it been there? Doorways exert a powerful hold over the imagination and they can either repel or tug at your curiosity. This rather enigmatic structure in the woods has an other-worldly quality that invites you to walk on through and explore what lies behind. I won’t say why it is there but there are other features by the shore connected to it. A friend recently told me that this area of Longford is part of what is often referred to as the Kerry of the North. 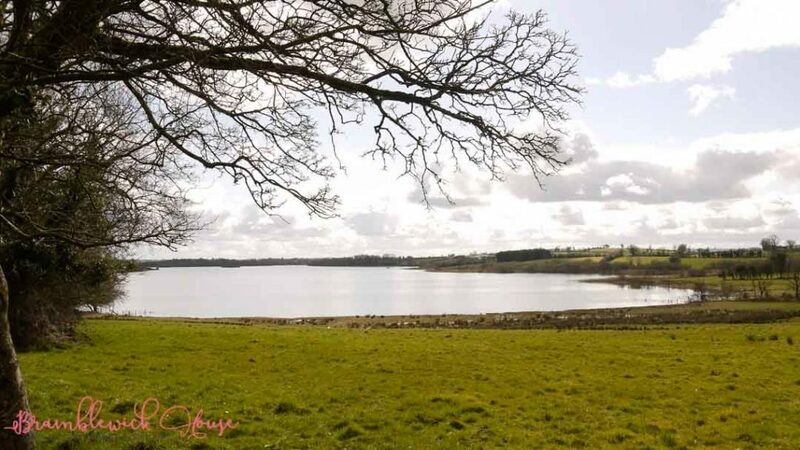 This is lake country with fingers of water stretching out into counties Cavan and Leitrim to the North-East and North-West which is perhaps why the midlands area wanted its own tourist brand outside of Ireland’s Ancient East which it is part of at the moment. The area has its own distinct flavour and carries a natural beauty deserving of its own place in the country’s attractions. In keeping with the lack of attention given to the area from outside, this new brand has been named Ireland’s hidden Heartlands but it is not just the aesthetic allure of these watery places that makes them special. There is a whole history attached to them which makes them culturally important to the country but that is the subject for another write up.